The date is year 2 of the Eiroku period (1560 AC). Japan is a land torn by civil war between the warring clans lead by the fierce and cunning daimyos, who struggle to gain as much influence and territory as possible to attain the status of Shogun, to have the whole country under their command. But this is not simply an age of incredible human feats of strength and will and wits, it is also a time of fantastic stories of monsters and Heroes, of a sage that knew all answers, of a palace under the sea, where the king of the ocean rules supreme, of the bird-like tengu, terrible spirits who cast misery upon the land, of the Oni, ogres of insurmountable strength and appetite for human flesh. You are one of a handful of elite retainers at the orders of Oda Nobunaga. The circumstances that led you all to where you are today are as diverse as the colours of the trees in autumn; perhaps your family was always from this lands, and it was fitting for a young warrior to pledge himself to his Lord. Or perhaps you are a wandering monk, who saw in the daimyo a great destiny. It may be that you are a gaijin, a foreigner who arrived in a ship from distant lands, perhaps China or Korea, or even farther away. You might have your own reasons to stick with Nobunaga, be it spying for another clan or nation, or simple devotion, or you might have been commanded by higher beings. Perhaps you are retainer of the court of the lakes, and were sent here by the Dragon King as a favour. Be it that your are an adept of the sword, a prodigy of the bow, or a priest commanding the power of the spirit realm, you have been chosen by Nobunaga to form this band of elite warriors, his chosen five. You've ridden to battle, or taken care of special missions many time and today was no different. You were sent to assault the enemy, the army of Imagawa Yoshimoto, a rival daimyo, who were preparing to assault the hastily fortified Zenshō-ji (Ji standing for temple). However as you were sneaking through the forest, and about to attack, a huge deafening explosion reaches your ears. As you raise your head you see the temple trashing in fire and a huge cloud of smoke rising from it. Between the leaves of the trees you can see the would be attackers are as startled as you. Very well, there we have our intro. I have been rumiating this idea for over a year now, and finally decided that I have enough free time (or that I dont care how busy I am) to make it a reality. The setting is basically Sengoku period in Japan, so roughly between 1400-1600. Most of what a person knows about “old” japan is from this period, so samurai, shinobi, you name it, its probably from this period. It is also a very interesting period for a game too because of all the conflict. Also, the setting incorporates mystical and mythological elements into the “normal” history, so monsters and spirits, and whatever else you can think of. You dont need to be versed in japanese fairy tales to make a magical character, just some wikipedia-do, or asking me for guidance would be more than enough if you want something historically relevant, which is not even a requisite, standard “priest” or wizard type of character are perfectly fine. This is meant to be a sort of sandbox game where players decide what they want to do with their lives. There would be a general “objective” or leading quest, if you will, which is pretty evident from the intro, and would be present in some way or the other throughout the first chapter of the game, but exactly where you go, what you do, that would be up to the players to decide. You dont need an extensive knowledge of Japan to know your way around, or to know relevant information of what to do; think dungeons and dragons and you are set! As you probably read in the intro, the character can be of any origin, japanese or foreigner, human or from the spirit realm, your choice. You could even play a tengu or other monstrous race if you manage to put up a convincive background for it. Still, it would be very rare to see one, so a full Oni squad is probably not good. I think that it goes without saying that samurai and ninjas are great picks =P Regarding backgrounds, while some of you might have wanted to see Nobunaga dead, and others were his number 1 fan, try to have character objectives and complications that are not too strict. Say, if you pick “My PC wants to spy on Nobunaga to report back to the Mori clan” thats fine because now that he has disappeared, you still have motivation to search for him to report back,, but if you say “My PC wants Nobunaga dead” then your PC might think, “Oh, well it seems Im done here”. I was thinking of incorporating a money system, as I wanted to make the first chapter a sort of survival challenge, but I’m still deciding on that. Other things are floating in my head, so feel free to ask, and we will get questions answered and hopefully have a good game. I have posted this same recruitment in Ronin to gather interest and see who would like to apply. Inspiration: For those geek enough, you might smell something familiar in the setting. If you ever played the Gekokujo mod in Mount and Blade Warband, you can probably see the resemblance. The game basically placed you with a stick (or a knife, your choice) in the middle of sengoku era Japan, and you objective is just do whatever you want. I hope to give the players the same freedom, but at the same time create an interesting main plot and subquests. Last edited by Camus on Mon Sep 03, 2018 7:50 pm, edited 4 times in total. Hey,my bro wants to know how far along in Nobunaga's timeline is it set? As I stated in the intro, the year is 1560, the scene depicted is the battle of okehazama, the first prominent victory of Nobunaga outside of owari province, but now fate has it that it is dfferent from what has happened in our reality. 3e? I’m bowing out, then. Have fun, everybody! "Respect me for my skill, instead of judging me for who I am." Baring a young face with a healthy cream tint, her face remains unmarred in-spite of the many battles she's fought. Her loose shoulder length dark brown frames her face, drawing people's attention inward to her deep black eyes. Smiling is a rare sight to the beholder, Jin's stern attitude keeping her face in near constant neutrality. The armor she wears is that of her elder brother's who served as a soldier during a skirmish on the northern border. While he never made it home, his armor was returned to the Dai family. Jin was never meant to be a common housewife, this was a fact known to her family even when she was just a little girl picking fights with the other village children. They've tried for years to instill in her a sense of femininity, to bring their family honor by finding a handsome young man to settle down with upon reaching maturity. While she may have brought her parents great shame, her brother Li saw in her the spirit of a warrior. When he was home from battle, he chose to spend most of his free time with her, teaching her what it meant to serve the emperor in battle. His visits were always brought her great joy, and they were moments she anticipated every spring. Yet one spring came and went, with no sign of him anywhere. It would be well past winter when a messenger approached her father, a package in hand. In a fit of emotion the young woman ran off into the countryside to mourn, collapsing against the old marked stones where they had spent so much of their youth. For hours she wept, until her tears of sorrow slowly drained away. It was near late in the evening when she decided to return home, but she stumbled across an overturned rock and hit the ground hard. The ground suddenly began to give, collapsing inward and taking Jin with it. Upon regaining consciousness hours later, she was shocked to find herself in some ancient tomb. Old weapons of war, strange artifacts, and the mummified remains from an ancient year were caked in layers of dust and dirt. In the center of it all, was a sword. Golden in color, it stood out like a princess in village squalor. Jin could feel it calling out to her, urging her to pull it from where it lay partially embedded in the ground below. It was sharper then any blade her brother had ever wielded, and flowed through the air like a stream cut through the earth. Gripped in her hand the exhaustion she felt before seemed to melt away, leaving her to feel as if she could fight a thousand battles. In it, she also felt the embrace and love of her departed brother, as if he'd brought her to it as one final parting gift. 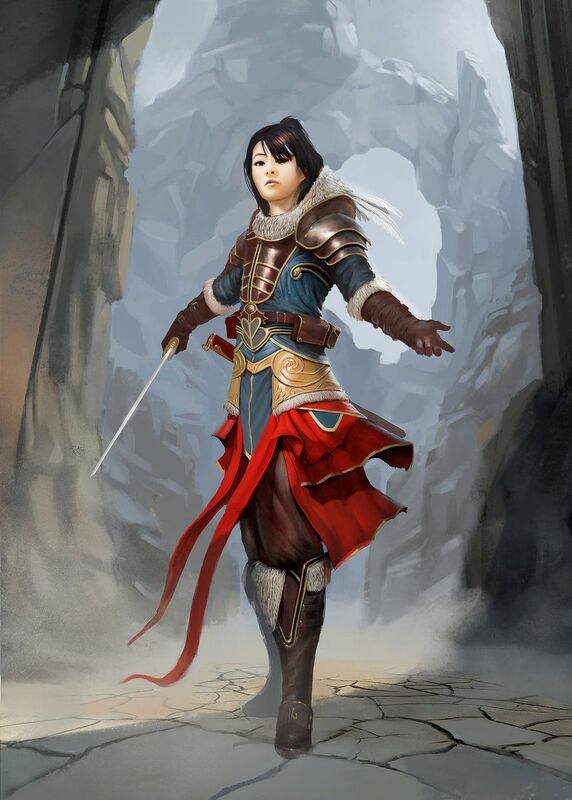 Confidence restored and the sword in hand, sheathed in an equally immaculate scabbard black scabbard, the young woman climbed out of the forgotten tomb and into the nighttime air. She returned home for one final visit, to take the armor her family had already put on display within a wooden cabinet. Dressed now as the woman of war she knew herself to be, she left her home for the final time, eventually seeking passage across the sea to Japan. It was here that she sought ought the help of an Onna-bugeisha, a noble woman who served the Oda clan in battle as well as any man. Through her she learnt how to wield the weapon with grace and power, and in turn learning the way of the samurai. She served Nobunaga as a common soldier for years, until he finally saw fit to call her one of his chosen few. Motivation: Respect Beyond mere wealth and property, what Jin truly desires able all other things is to be respected for the great warrior she is. Woman of the Mainland: It's one thing to be a woman more interested in warring then homekeeping, or to be a foreigner from the mainland. By being both at once, she needs to fight more challengers then just those wielding a sword. Honor: In addition to learning how to fight, the Onna-bugeisha she served under taught her to respect the Way of the Warriors. This Bushido has melded with her own personal sense of honor, and now makes up a core part of her personality. She will always refuse to slay the defenseless, and takes the promise of her enemy's surrender with deadly seriousness. Headstrong: Though her master taught her to never rush into things without thinking, Jin continues to be stubborn and cautiounless in her approach. Problems must be dealt with first hand, not uselessly debated by fat old men sitting within the comfort of their palaces. Sword of the Tomb: A blade of dark gold bearing a black criss crossed pattern on it's Surface and it's edge sharpened to a fine point, the sword she uncovered from the tombs remains as mysterious now as it did then. Even the scripture engraved is illegible to her, yet it thrums in her hands with ancient magic and power yet to be fully realized. The character is gonna be a Yakuza thug turned Scout/Archer named Hiruma Akahito(putting last name first like i'm supposed to,Camus ). Posted my application over on Ronin. I'd crosspost it here but the formatting is all different. Camus, given that you're recruiting from multiple places, where are you going to run the game? Well I guess it will depend on player preferences, im fine running it either site. What he/she said. I have no preference.